Toxylicious: Something for the mini me's !!! Something for the mini me's !!! Taking a break from all things girlie...this post is specially for mums and dads of little ones who are mad about Postman Pat. 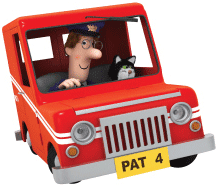 To celebrate this occasion, children will be given the chance to send in birthday cards and drawings for Pat to read and as a thank you Postman Pat will respond to each one throughout September giving children the chance to receive a personal message from their favourite character! !